Dame Marie Roslyn Bashir AD, CVO (born 1 December 1930) is the former and second longest-serving Governor of New South Wales. Born in Narrandera, New South Wales, Bashir graduated from the University of Sydney in 1956 and held various medical positions, with a particular emphasis in psychiatry. In 1993 Bashir was appointed the Clinical Director of Mental Health Services for the Central Sydney Area Health Service, a position she held until appointed governor on 1 March 2001. She has also served as the Chancellor of the University of Sydney (2007–2012). Bashir retired on 1 October 2014, and was succeeded as governor by General David Hurley. Marie Roslyn Bashir was born in 1930 in Narrandera, New South Wales, to Lebanese-born parents Michael Bashir and Victoria Melick. Her father and her paternal uncle were both medical graduates from the American University of Beirut. Her maternal family had come to Australia in the 19th century. Bashir attended Narrandera Public School and in 1943 enrolled at Sydney Girls High School, which her mother had also attended. Bashir then moved to Sydney to live with her grandmother in order to attend. Upon graduating, Bashir studied at the Sydney Conservatorium of Music, becoming a proficient violinist. She completed the degrees of Bachelor of Medicine and Bachelor of Surgery (MBBS) in 1956 at the University of Sydney Medical School, residing at The Women's College from 1950 to 1955. In 1959, she was elected to the College Council, became Honorary Secretary in 1960 and was Chair from 1982 to 1990. She took up life membership of the College Union in 1969. While at university, she met rising rugby player, Nicholas Shehadie, to whom she was married on 23 February 1957, in St Philip's Church, Sydney, by Felix Arnott, then the Warden of St Paul's College, University of Sydney. They had their first child, Michael, in 1959, followed by two daughters, Susan and Alexandra. Upon her graduation in medicine, Bashir took up a posting as a junior resident medical officer at St Vincent's Hospital and then to the Royal Alexandra Hospital for Children. After first living in Elizabeth Bay, Bashir and Shehadie moved their family to Pendle Hill in Western Sydney, where Bashir worked as a General Practitioner. However, wanting to assist people suffering from mental illnesses, Bashir eventually decided to take up postgraduate studies in Psychiatry. To make this easier, Bashir and her family moved back into central Sydney to Mosman on the North Shore. In 1971 Bashir was named as "Australian Mother of the Year". When Shehadie was made Lord Mayor of Sydney, Bashir became the Lady Mayoress of Sydney from 1973 to 1975. When Shehadie was knighted in 1976, Bashir acquired the title Lady Shehadie, a title she did not use. After completion of postgraduate studies in psychiatry, she was made a Member of the Royal Australian and New Zealand College of Psychiatrists in 1971, becoming a Fellow in 1980. From 1972, Bashir was a teacher, lecturer and mentor to medical students at The University of Sydney. In 1972 Bashir was appointed Director of the Rivendell Child, Adolescent and Family Service, which provides consultative services for young people with emotional and psychiatric issues. In 1987 she was appointed director of the Community Health Services in the Central Sydney Area Health Service, which put emphasis on early childhood services, migrant and Indigenous health as well as the elderly. On 13 June 1988 she was made an Officer of the Order of Australia (AO) "In recognition of service to medicine, particularly in the field of adolescent mental health". From 1990 to 1992, she served on the New South Wales Women's Advisory Council. In 1993, she was appointed as Clinical Professor of Psychiatry at the University of Sydney, and in 1994 as the Clinical Director of Mental Health Services for the Central Sydney Area. This was a time of major reform in mental health service delivery, which contributed to substantial change in the provision of public sector mental health services. She served until 2001. In her university role, Bashir is instrumental in developing collaborative teaching programs between colleagues in Vietnam and Thailand with Australian psychiatrists, chairing the University of New South Wales Third World Health Group (1995–2000) and supporting various financial and social support programmes for International students. In 1995, in a partnership with the Aboriginal Medical Service, Redfern, she established the Aboriginal Mental Health Unit, which provides regular clinics and counselling at both the Aboriginal Medical Service in Sydney and mainstream centres. From 1996, Bashir also took up the consultative role of senior psychiatrist to the Aboriginal Medical Service. As well as championing the health of indigenous Australians, Bashir also continued her focus on youth and juvenile issues, particularly through her terms chairing the NSW Juvenile Justice Advisory Council (1991–1999) and as consultative psychiatrist to Juvenile Justice Facilities (1993–2000). On 1 January 2001, Bashir was awarded the Centenary Medal. In early 2001, on the recommendation of Premier Bob Carr, Elizabeth II, Queen of Australia, appointed Bashir Governor of New South Wales, making her the state's first female governor, and the first governor of any Australian state of Lebanese descent. She was sworn in on 1 March 2001, and on 30 March she was appointed a Companion of the Order of Australia (AC). Upon her appointment, Sydney Morning Herald journalist David Marr noted, "what could be more valuable behind the scenes in Macquarie St than this woman's unique expertise with troubled adolescents?" Bashir's appointment was welcomed by both sides of politics and commended in a Sydney Morning Herald editorial as "an inspired choice" as well as noting that Bashir would be "a powerful advocate for the powerless". In that role, Bashir departed from past practice. For Australian aborigines, Bashir launched an indigenous health initiative to support indigenous medicine and nursing students as well as supporting the progress of reconciliation. On the very day of her inauguration, Bashir agreed to become Patron of the Gay and Lesbian Counselling Service, which addresses mental and social issues in the LGBT community. This was the first time a NSW governor had supported a gay organisation. In 2005 Bashir opened the Sydney Gay and Lesbian Mardi Gras Festival in a concert in Hyde Park and credited the event with fostering "that sense of freedom which springs from the considerable diversity within our society – diversity of race, religion, culture and also sexual orientation [...] We must never take these things for granted because most of you would agree that across the world today an extraordinary winding back to many previously discarded attitudes is taking place, not only affecting gay and lesbian groups, but women's health and many aspects of social justice." In 2002, Bashir became Patron of the Australia-Vietnam Medical Trust and became intimately involved in collaborative health programs in Vietnam, particularly in rural areas. On 17 May 2001, the Governor-General, Sir William Deane, invested Bashir as a Dame of Grace of the Most Venerable Order of the Hospital of St John of Jerusalem (DStJ). Having previously studied violin at the Conservatorium of Music, Sydney, in 2002 Bashir was asked to become the Patron of the Sydney University Graduate Choir. She is also a Patron of Opera Australia, the Sydney Symphony Orchestra, Sydney Philharmonia Choirs, Pinchgut Opera and the Australian Archaeological Institute at Athens. In 2003 Bashir received the Mental Health Princess Award, awarded by Princess Galyani Vadhana of Thailand, for contribution to collaborative mental health programs between Australia and Thailand and in 2004 she was recognised as an Australian Living Treasure. In 2004 she was made an Honorary Member of the United Nations Development Fund for Women (UNIFEM). In March 2004, during a visit to Lebanon, Bashir was appointed a Grand Officer of the National Order of the Cedar by General Emile Lahoud, President of the Republic of Lebanon. On 14 September, Premier Carr announced that he would recommend to the Queen that Bashir's term be extended for another three years. Buckingham Palace confirmed his recommendation on 1 October saying that: "The Queen is content for Her Excellency Professor Marie Bashir AC, to remain in her current position until February 2008 as recommended." On 31 March 2006, the Queen appointed her a Commander of the Royal Victorian Order (CVO). Bashir was involved in the high-profile legal case against a psychiatrist called Dr Brendan O’ Sullivan and the NSW health service, in which she was falsely cited in his dismissal; using the opportunity to claim sovereign immunity, usually only used by the Crown. In April 2007 Bashir was elected by the University Senate to take up a four-year appointment as Chancellor of the University of Sydney on 1 June 2007. It was announced on 15 October 2007 that the Queen, on the recommendation of Premier Morris Iemma, had extended Bashir's appointment as governor for a further four years to February 2012. On 4 November 2009, she was invested as a Chevalier of the Ordre National de la Légion d'Honneur by the President of France, Nicolas Sarkozy, and presented by the Ambassador of France to Australia, Michel Filhol. As the longest-serving incumbent state governor, Bashir held a dormant commission to act as the Administrator of the Commonwealth when the Governor-General of Australia was absent from Australia. She held the position of Administrator many times: from 10 to 17 July 2007, 30 September to 12 October 2007, and 20 April to 4 May 2008 in the absence of Michael Jeffery, and from 30 July to 6 August 2008, 5 to 19 November 2008, 17 March to 2 April 2009, and 7 to 12 June 2010, in the absence of Quentin Bryce. "The only way that they [the NSW Government] can disappear, so to speak, is if there's a vote of no confidence... Elections do come round from time to time so it's back in the hands of the people." In late 2010, Mosman Municipal Council decided to name the new Sports centre in Rawson Park for Bashir in recognition of her service to both New South Wales and the Mosman community. She officially opened the "Marie Bashir Mosman Sports Centre" on 10 December 2010 with the Mayor, Cr. Anne Connon. On 14 September 2011, Liberal Premier Barry O'Farrell announced that he had recommended to the Queen that Bashir's term be extended for another two years to 2014, which had been accepted: "Over the past 10 years the Governor's caring nature, her genuine interest in local communities and her extraordinary work rate have endeared her to people everywhere...Because of her diverse background, career and interests, Professor Bashir has given a historic and important post a contemporary relevance and resonance." From the time of her commencement as governor, Bashir, like her immediate predecessor, did not reside in Government House, Sydney, retaining it for reception and official purposes. However, in October 2011, the new Premier Barry O'Farrell announced that the Bashir had agreed with O'Farrell's offer to move back into Government House: "A lot of people believe the Governor should live at Government House. That's what it was built for ... [A]t some stage a rural or regional governor will be appointed and we will need to provide accommodation at Government House so it makes sense to provide appropriate living areas". However, because Government House has not been a residence for fifteen years, O'Farrell also announced that the Bashir would initially move into a smaller adjacent building, called the chalet, while refurbishments of the main wing occur, with a proposed move into the main house "before Christmas". On 19 April 2012, Bashir was presented with the insignia of a Grand Cordon of the National Order of the Cedar by the President of Lebanon, General Michel Suleiman, at Government House, Sydney, during his state visit to Australia. At a meeting of the University of Sydney Senate in May 2012, Bashir announced her intention to retire as Chancellor. At a ceremony marking her retirement as Chancellor, her portrait depicting Bashir as Chancellor by Shen Jiawei was unveiled, to hang in the Great Hall. Also in April, it was announced that Bashir's term as governor, which had been expected to expire in February 2014, had been extended another six months to September 2014, at which Bashir expressed her intention to retire. On 21 October 2013 Premier O'Farrell and the Minister for Education Adrian Piccoli announced that the new state primary school in Strathfield on the old site of the Sydney Adventist College would be named the "Marie Bashir Public School" in her honour. At the announcement O'Farrell noted that: "Naming this school after Professor Bashir honours her outstanding contribution to NSW and is a reminder that she achieved all her distinctions after being educated at public schools – from Narrandera Public School to Sydney Girls High School". On 28 November 2013 the Premier of NSW announced that the Queen had given approval for the title of "The Honourable" to be accorded to the governors and former governors of New South Wales. On 5 December 2013, the University of Sydney decided to rename the Sydney Emerging Infections and Biosecurity Institute in her honour to become the Marie Bashir Institute for Infectious Diseases and Biosecurity (MBI). Bashir was promoted to the rank of Officer within the National Order of the Legion of Honour by the President of France, François Hollande, and invested with the insignia at a ceremony at Government House Sydney on 26 May 2013, by Général Regis Outtier, Secretary General of the Society of the Legion of Honour. In the 2014 Queen's Birthday Honours, Bashir was made a Dame of the Order of Australia "For extraordinary and pre-eminent achievement and merit in service to the administration, public life, and people of New South Wales, to medicine, particularly as an advocate for improved mental health outcomes for the young, marginalised and disadvantaged, to international relations, through the promotion of collaborative health programs, and as a leader in tertiary education". Ahead of her impending retirement from office on 1 October, Bashir noted that the time was right for her to go just short of the record in office set by Sir Roden Cutler: "a war hero who lost a leg serving this country, I would like to think of him as the longest serving governor" and that "The time is right, It was myself who said I would conclude my term around the anniversary of World War One. That would mean that I would not exceed the longest term of Sir Roden Cutler for whom I had the greatest admiration and respect." She also made clear her interest in continuing her community work, particularly through the area of post-traumatic stress disorder in Australian Defence Force veterans. In September 2014, her official portrait as governor by Archibald Prize finalist Mathew Lynn was unveiled at Government House by Premier Mike Baird. Bashir's style and title as governor in full was: Her Excellency Professor The Honourable Dame Marie Bashir, Dame of the Order of Australia, Commander of the Royal Victorian Order, Governor of the State of New South Wales in the Commonwealth of Australia. 1980 Fellow of the Royal Australian and New Zealand College of Psychiatrists (FRANZCP). 2004 Honorary Member of the United Nations Development Fund for Women. 2006 Honorary Fellow of the Australian Academy of Technological Sciences and Engineering (Hon.FTSE). 2007 Honorary Member of the Australian Medical Association. 3 May 2002: Honorary Doctorate of the University (D.Univ) by the Australian Catholic University. 11 October 2002: Honorary Doctor of Medicine (MD) by the University of Sydney. 13 November 2004: Honorary Doctorate of the University (D.Univ) by Southern Cross University at its Lismore Campus. 2004: Honorary Doctor of Science (D.Sc) by the University of New South Wales. 2007: Honorary Doctor of Science (D.Sc) by the University of Wollongong. 20 April 2012: Honorary Doctorate of the University (D.Univ) by Macquarie University. 17 April 2014: Honorary Doctor of Letters (D.Litt) by the University of Western Sydney. 1 March 2001: Honorary and Regimental Colonel in the Royal New South Wales Regiment. 1 March 2001: Honorary Air Commodore of No. 22 Squadron Royal Australian Air Force. 9 October 2008: Honorary Commodore, Navy Warfare Training, Royal Australian Navy. 22 August 2014: Honorary Governor of the New South Wales Police Force. Marie Bashir Peace Awards, National Council of Women of New South Wales. Marie Bashir Mosman Sports Centre, Mosman. Marie Bashir Public School, Strathfield. Marie Bashir Institute for Infectious Diseases and Biosecurity (MBI), University of Sydney. Governor Marie Bashir Reading Room, State Library of New South Wales. Professor Marie Bashir Centre, Royal Prince Alfred Hospital, Camperdown. ^ "General Hurley named as NSW Governor". Sky News. 5 June 2014. Archived from the original on 6 June 2014. Retrieved 5 June 2014. ^ Coleman, Sarah. "Marie Bashir: From Psychiatry to Politics". World Press Review. Retrieved 20 July 2008. ^ "Distinguished Old Girls". The History of Sydney Girls High School. Sydney Girls High School. Archived from the original on 22 June 2008. Retrieved 25 May 2008. ^ "Marie Bashir". The Women's College. Archived from the original on 18 February 2011. Retrieved 8 August 2010. ^ a b c "Professor Marie Bashir elected University Chancellor" (Press release). University of Sydney. 30 April 2007. Retrieved 21 January 2010. Citation: In recognition of service to medicine, particularly in the field of adolescent mental health. ^ D.Marr, Sydney Morning Herald, 2 March 2001. ^ "Concert opens Sydney Mardi Gras". Australian Broadcasting Corporation. ABC News. 5 February 2005. Retrieved 13 June 2014. ^ "List of Patronages » The Governor of NSW". Archived from the original on 11 April 2013. Retrieved 15 August 2012. ^ "Sydney Philharmonia Choirs. About us". Sydney Philharmonia Choirs. Archived from the original on 17 March 2012. Retrieved 15 August 2012. ^ a b "9th National Rural Health Conference" (PDF). Archived from the original (PDF) on 20 February 2011. Retrieved 21 January 2010. ^ "Australia's Living National Treasures". National Trust of Australia. Archived from the original on 2 November 2009. Retrieved 3 March 2009. ^ a b c d "Her Excellency Professor The Honourable Marie Bashir AC CVO". Gorvernor of New South Wales – NSW Department of Premier and Cabinet. Archived from the original on 17 May 2014. Retrieved 8 June 2014. ^ "Governor of New South Wales Reappointment". Hansard. NSW Parliament. 26 October 2004. Retrieved 22 August 2010. Citation: Governor of New South Wales. ^ Ruth, Pollard (30 June 2006). "Governor falsely cited in doctor's dismissal". The Sydney Morning Herald. Retrieved 5 November 2014. ^ "Bashir named Uni of Sydney chancellor". The Sydney Morning Herald. Fairfax Media. 30 April 2007. Retrieved 9 August 2010. ^ "NSW Governor Bashir to stay on". ABC News. Australian Broadcasting Corporation. 15 October 2007. Retrieved 22 August 2010. ^ a b "Official inauguration of the new building of the Sydney Alliance Française". French Embassy, Australia. Archived from the original on 17 June 2010. Retrieved 21 January 2010. ^ "Royal sign manual – Commission" (PDF). Gazette S205. Commonwealth of Australia. 17 June 2003. Archived from the original (PDF) on 21 January 2012. ^ Bennett, Adam (5 June 2010). "NSW ministers quit, forcing new reshuffle". The Age. Melbourne: Fairfax Media. Retrieved 22 August 2010. ^ "Governor can't sack NSW Government". ABC News. Australian Broadcasting Corporation. 10 June 2010. Retrieved 22 August 2010. ^ a b "Sports hub named after Marie Bashir". The Mosman Daily. 30 October 2010. Retrieved 31 August 2010. ^ "Play begins at sports facility". The Mosman Daily. 12 December 2010. Retrieved 31 August 2010. ^ "Governor of New South Wales". Hansard. NSW Parliament. 14 September 2011. Archived from the original on 23 March 2012. Retrieved 23 September 2011. ^ a b "Statement on the visit of the President of Lebanon" (Press release). Office of the Prime Minister. 16 April 2012. Archived from the original on 27 November 2012. Retrieved 19 April 2012. ^ "Senate Meetings". Decisions of the Senate. University of Sydney. 7 May 2012. Retrieved 12 May 2012. ^ "Celebrating Her Excellency Professor Marie Bashir AC CVO". News. University of Sydney. 13 December 2012. Retrieved 18 April 2014. ^ "NSW Governor Marie Bashir to retire". The Daily Advertiser. 19 April 2013. Retrieved 2 April 2014. ^ a b Press Release (21 October 2013). "Marie Bashir Public School: new school named in honour of NSW Governor". NSW Government. Archived from the original on 12 December 2013. Retrieved 9 December 2013. ^ a b "MBI – The University of Sydney". University of Sydney. Retrieved 2 April 2014. ^ a b "Vice Regal Column". The Sydney Morning Herald. 27 May 2014. ^ a b "The Queen's Birthday 2014 Honours List – Gazette 1 Order of Australia" (PDF). Governor-General of Australia. Australian Government Gazette. 9 June 2014. Retrieved 9 June 2014. ^ "Australia's first female governor to step down after 13 years". Ninenews.com.au. Nine News. 24 September 2014. Retrieved 1 October 2014. ^ a b Barlass, Tim (21 September 2014). "Retiring Governor of NSW Marie Bashir backs terror raids". The Sydney Morning Herald. Retrieved 1 October 2014. ^ "Marie Bashir (2014)". Mathew Lynn. Archived from the original on 27 February 2016. Retrieved 24 August 2015. ^ Wyndham, Susan (25 October 2014). "Undercover book news: What's a Booker Prize worth?". Sydney Morning Herald. Retrieved 27 November 2014. ^ "Honorary Doctorates Conferred 2002". Australian Catholic University. Retrieved 16 March 2014. ^ "Professor Marie Bashir AC". University of Sydney. Retrieved 3 March 2009. ^ Turnbull, Samantha (15 November 2004). "SCU's Lismore birthday bash". The Northern Star. Retrieved 16 March 2014. ^ "Honorary Award Recipients". University of New South Wales. Retrieved 16 March 2014. ^ "Honorary Degree and Fellowship holders". University of Wollongong. Archived from the original on 15 March 2014. Retrieved 16 March 2014. ^ "NSW Governor Marie Bashir awarded honorary doctorate". Macquarie University. 20 April 2012. Archived from the original on 7 January 2013. Retrieved 20 June 2012. ^ "Admitted to the degree of Doctor of Letters (honoris causa)". Vice-regal Events. Governor of New South Wales. 17 April 2014. Archived from the original on 17 May 2014. Retrieved 16 May 2014. 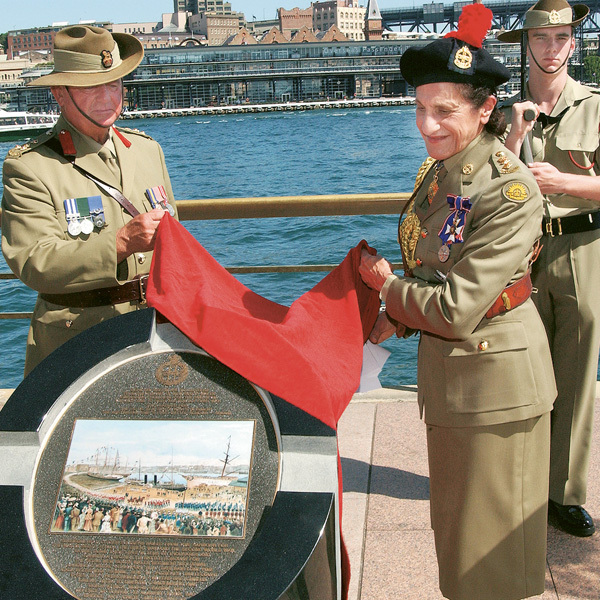 ^ "Royal New South Wales Regiment memorial" (PDF). Vasey Housing Association. Archived from the original (PDF) on 11 September 2009. Retrieved 3 March 2009. ^ "No.22 (City of Sydney) Squadron, RAAF, Department of Defence". Australian Government. Retrieved 3 March 2009. ^ "Vice-Regal Review of the National Reserve Forces Day parade" (PDF). Reserve Forces Day Council. Retrieved 29 August 2011. ^ Hancock, Shelley (11 October 2011). "Marie Bashir Peace Awards". Hansard – Legislative Assembly. Parliament of New South Wales. Retrieved 9 December 2013. ^ Munro, Peter (20 October 2014). "Marie Bashir honoured by the State Library". The Sydney Morning Herald. Retrieved 23 August 2015. ^ Sharples, Sarah (14 November 2014). "Royal Prince Alfred Hospital opens new mental health hospital called the Professor Marie Bashir Centre". Inner West Courier. Retrieved 23 August 2015. Clune, David; Turner, Ken (2009). The Governors of New South Wales: 1788–2010. Sydney: Federation Press. Bashir, Marie; Schwarz, Michael (1988). "Asia in Australia: from adversity to resiliency and strength: some aspects of the mental health of Asian refugee children.". In Bennett, David; Williams, Murray (eds.). New Universals: Adolescent Health in a Time of Change. Curtin, ACT: Brolga Press for the Australian Association for Adolescent Health. pp. 35–38. ISBN 0958830959. Bashir, Marie; Bennett, David, eds. (2000). Deeper dimensions: culture, youth and mental health. Parramatta, NSW: Transcultural Mental Health Centre. ISBN 1876109874. Bashir, Marie (March 2004). "Langford Oration 2003 [The challenges facing medical administration and a biographical account of Sir Robert Garran]". Quarterly (Royal Australian College of Medical Administrators). 37 (1): 5–9. ISSN 1325-7579. Bashir, Marie; Hush, Noel (October 2010). "Sir Bruce Williams: A Thirst to Know, and a Reverence for Truth". Quadrant. 54 (10): 66–68. ISSN 0033-5002. 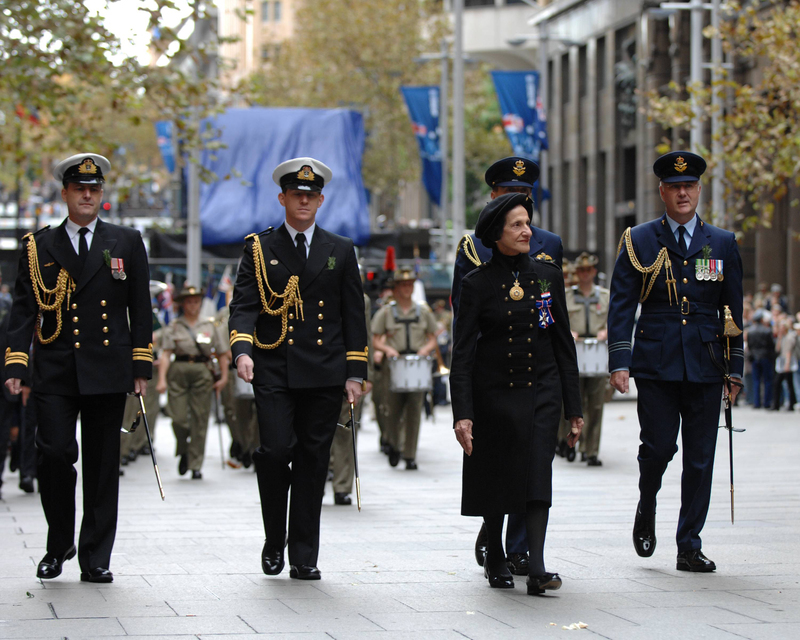 Wikimedia Commons has media related to Marie Bashir. Photo: Bashir with RADM Nigel Coates, Commander Australian Fleet, at 2009 RAN Fleet Review. Photo: Bashir with ADCs at ANZAC Day 2008. This page was last edited on 20 March 2019, at 08:47 (UTC).